"Feng Shui" uses numerous symbols and signs, but the practical side of this art rests on the ability to read these signs in the environment, that is surrounding a person and feel the movement and the changes in it. Mount ain peaks, river valleys and other forms of the landscape are associated with a variety of animals. Among the most popular is the Dragon, which is associated not only with the land, but also with the sky, the sea and the Emperor of China. 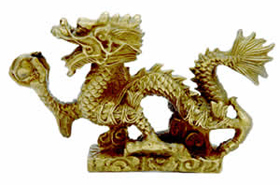 According to the legends, Dragon is a symbol of power, righteousness, and male strength. It can be both: visible and invisible, may take different forms by his own will. Dragon can soar to the skies in the form of a storm clouds or be coiled in the deep ocean, he can be as small as a silkworm, and as huge as the universe itself. Chinese mythology enumerates four supreme Dragons governing the four seas - northern, southern, eastern and western. Parts of the body of the Dragon, that dwells under the earth, are identified with the forms of the landscape. Upland soil would be the Dragon's veins and arteries, and the energy "Qi" - his blood. Mountain streams and waterfalls, as well as the flows of the underground rivers are "Qi" within the body of a Dragon. There are hills, mountains and peninsulas, reminiscent of tigers, monkeys, dogs and other animals. Some of them may have an adverse impact on those people, who are living in the vicinity ("grab and devour" them), while others serve as defenders for those who lives nearby. The idea of the animal kingdom, reflected in the forms of inanimate nature, puts more emphasis in our understanding of the natural world. The world is full of unseen forces and beings, growing, getting old and dying, sleeping and eating. And since the human body belongs to the animal kingdom, we can not avoid the influence of those forces. Not only the figures of animals can be seen in the contours of the landscape. There are some rocks, reminiscent of a book or a writing pen, they are symbolically linked to the science and education and help people living nearby to achieve success in this field. The rock in the form of a rice cup is bringing wealth to people who are living in it's vicinity. Sometimes shapes of the rocks are reminiscent of a human body, so a rock in the shape of the head is a symbol of a guardian, securing the surrounding territory from the evil. In maintaining balance in the environment, Water is no less important than the Earth. Rivers are the energy channels, where goes the "Qi" energy. They can also be symbolically represented in the forms of dragons or serpents. In China, bends, branches and turns of the river flows are often associated with the life of Water Dragons. If the Water Dragon is not controlled, he can cause disasters, but with the proper handling he serves as a source of fertility. Water Dragon can also climb into the sky to bring rain, he is affecting the flows and the falling tides, as well as the weather phenomena (typhoons, droughts). In "Feng Shui" this mythical creature is quite real, and in order to maintain the natural balance it should be recognized and respected.